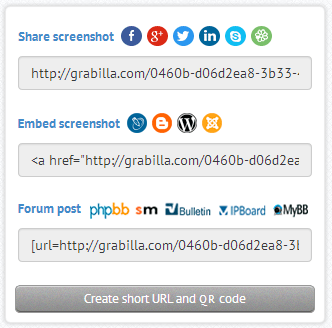 When you take screenshot with Grabilla, it will be automatically uploaded to our server. Top button is a direct link to image. This is useful when you want to see just an image without page. Also there are three links that you can use for sharing your captured screenshot. You can click on field to copy any of these codes. First is a link that you can send to your friends, insert in email, etc. Second is a code to insert this image into your website or blog post. Remember to switch to HTML mode when inserting. Third is a code for forum post. You can insert this code when you make a post on forum. the head. The issue is something not enough people are speaking intelligently about. I tend not to drop many remarks, however i did a few searching and wound up here How to quickly share screenshot. And I actually do have a couple of questions for you if it’s allright. Is it just me or does it look like some of these responses appear like written by brain dead people? Did you develop this website yourself? Please reply back as I’m planning to create my very own site and would like to learn where you got this from or just what the theme is named.